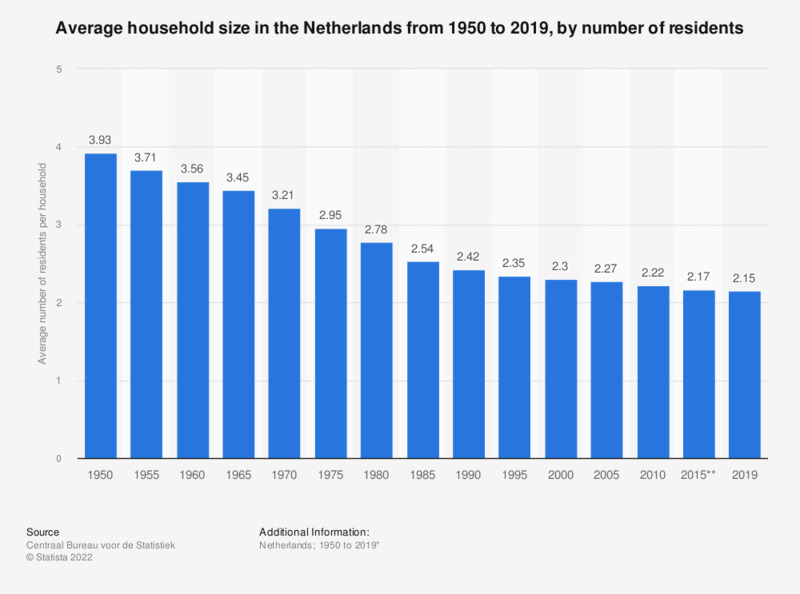 The statistic displays the average household size in the Netherlands from 1950 to 2018, by the number of residents. It shows that between 1950 and 2018, the average household size in the Netherlands decreased continuously, from 3.93 residents per household in 1950 to 2.15 in 2018. This represents a decrease of almost 50 percent in a time span of 66 years. In total, there are approximately 7.8 million households in the Netherlands, as can be seen in this statistic on the total number of households in the Netherlands by type. The largest number of these households were one-person households. The most recent figures show that there are approximately three million households in the Netherlands consisting of one only person. In the future, this is only expected to increase, as shows this recent forecast. If these numbers are correct, by 2060 there will be nearly 3.7 million one-person households in the Netherlands, an increase of nearly a million compared to today. * The numbers until 1987 are as of December 31, between 1988 and 1994 as of the middle of the given year, and from 1995 onwards as of January 1. ** As of 2014, approximately 35,000 persons that were initially considered as living in one-person private households are now counted as living in institutional households. This also had a slight impact on the average household size, as the total number of one-person private households increased because of this.